Canadian immigration intake levels are set to make new records in the coming year. The government of Canada has set a target of inviting 330,800 new immigrants to Canada in 2019. This exhibits a nearly 7 % increase over the 2018’s admission targets. Previously in October this year, Canada’s federal government unveiled the multi-year immigration levels plan, through which Canada aims to increase the total admissions by more than 13 percent between 2018 and 2021. According to the plan, an estimated 350,000 candidates shall be invited to Canada through it’s various economic, family and refugee programs. Immigration now contributes majorly to the growth of population and labor force in Canada. Many Canadian provinces are heavily relying on immigrants to address the growing need for workers. On the contrary, Quebec’s immigration plan for the next year runs counter to the motive in most other provinces of Canada. Quebec plans to demarcate immigration levels in 2019 — a reduction of around 10,000 than 2018. This measure was taken to ensure that the admitted immigrants can successfully integrate into the majority French-speaking province. Canada’s most populous province Ontario also plans an increase in the allocation of immigrants. The province has announced to nominate more number of candidates in 2019 than 2018 for permanent residence through Canada’s Provincial Nimination Program (PNP). This programallows the participating provinces and territories to independently select immigrants, to compensate the local labor market needs. 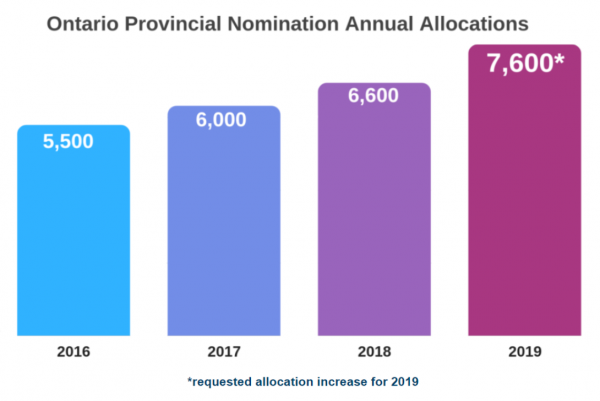 Ontario has confirmed to increase its 2019 nomination allocation to 7,600, which would be an increase of 1,000 nominations over its 2018 allocation of 6,600. Admissions through Canada’s Provincial Nomination Program are targeted to reach a record of 55,000 in 2018, which was 49,724 in 2017. The target is projected to rise again in 2019, to 61,000. Director of Communications for Ontario’s Ministry of Economic Development, Job Creation and Trade, Sarah Letersky said, “Demand for the [Ontario Immigrant Nominee Program] is strong, and the province continues to engage with the federal government on increasing the province’s annual allocation”. Other examples of provinces witnessing a rise in immigration are Newfoundland and Labrador and Manitoba. The Government of Manitoba attributed it’s population growth to the Manitoba’s Provincial Nominee Program. In the last three years, Manitoba was the fastest among Canadian provinces to set a record in 2016. Since it’s creation in 1998, the MPNP has invited 130,000 newcomers to Manitoba, and an estimated 13,000 immigrants are projected to arrive in the province next year. In a recent report, the Government stated that “Most of this growth is due to a concerted effort by the Manitoba Provincial Nominee Program to use immigration to recruit for labour market and entrepreneurial needs”. In October, the Government of Newfoundland and Labrador revealed that the applications to the province from prospective immigrants were up by 25 per cent this year over the first 10 months of 2017, and attributed this increase to the province’s five-year immigration action plan. According to this plan Newfoundland and Labrador aims to increase number of immigrants to 1,700 per year by 2022. Apply for Canadian Immigration now! Are you interested to get Canadian permanent residency through any of the PNP program then you may send us your CV at Wecare@immigrationexperts.pk or call us at 03075857777. Also subscribe to our channel at You Tube for more updates.